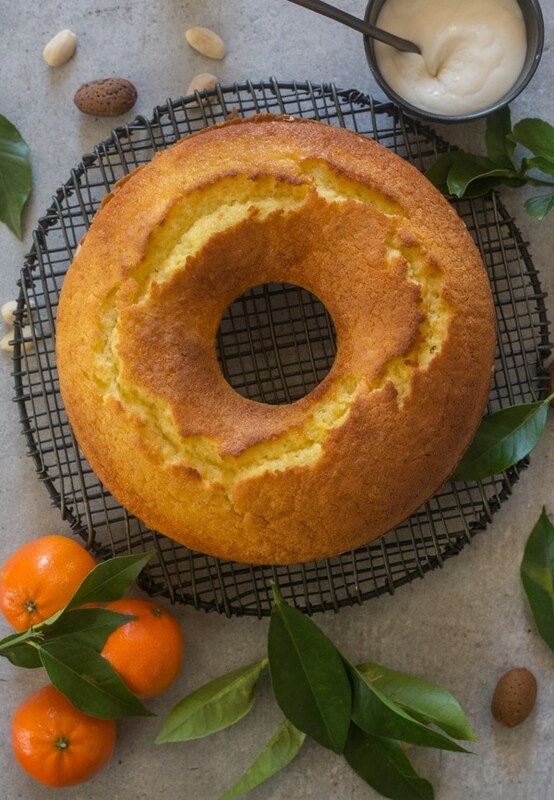 Italian Glazed Mandarin Orange Almond Cake, the perfect cake to serve any time during the day. Fresh Mandarin Oranges and a simple glaze make this cake a delicious dessert. Christmas Day in Italy is pretty well a 24 hour eating feast. When my mother-in-law was healthy we would start at one with lunch. Naturally the wood burning stove would be lit. In the oven would go the pans of Lasagna, Homemade Crepe Cannelloni, Roast Lamb, Roasted Potatoes and Roasted Onions. We would eat a Rollè, tossed salads, fennel salads, Baked Fennel and Peas. Just when you didn’t think you good eat anymore, out would come the Italian Playing Cards and the Tombola Board (Italian Bingo). And of course somebody would ask “who wants coffee”? And here comes the Pandoro, Panettone and Torrone! Nuts and my favourite Lupin Beans. Which I have soaking as I update this post. But don’t despair we never stopped there, my mother-in-law would decide that since the stove was burning she would have to make Pizza, and the dough making would begin. If you were lucky and she made too much dough, she would take pieces of the dough fry them and when they were still warm, sprinkle them with sugar. Sometimes the simple things are the best! Dinner would consist of the left overs, Pastas, the Meat dishes, fresh salads and of course 2 or 3 slices of her delicious Pizza. Unfortunately those Christmases are over and everyone is with their own family. Sad for us, our daughter has to work and won’t be back for Christmas this year. But we will see her in a couple of months. And when we do I will be sure to make her this Mandarin Almond Cake, two of her favourite ingredients. This is a moist cake as far as Italian Cakes go. 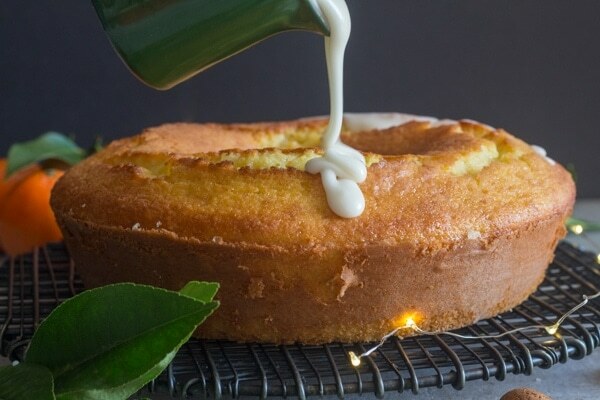 With a simple Mandarin Glaze it makes the perfect Christmas Morning Treat. How long can the Mandarin Orange Cake last? Most covered cakes, including this cake either frosted or unfrosted, cut or uncut, are perfectly fine at room temperature for about 3 days. 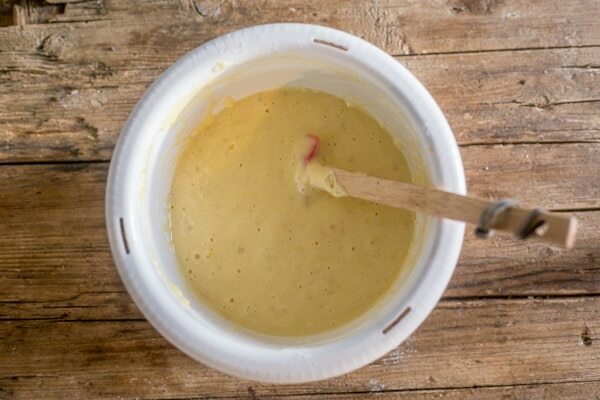 In a medium bowl whisk the flour, corn starch, baking powder and baking soda and salt. In another medium bowl beat until fluffy the eggs and sugar. Gently fold in the yogurt, and then fold in the flour mixture. Add the almonds, oil, juice and then the zest. Pour into the prepared cake pan (I usually use a springform pan, makes life so much easier) and bake for approximately 25-30 minutes or until tooth pick comes out clean. (time could be more or less, depends on your oven). Let cake sit approximately 15 minutes, then remove from pan. You can either glaze it with a simple icing sugar, mandarin juice and cream or a simple dusting of powdered sugar. 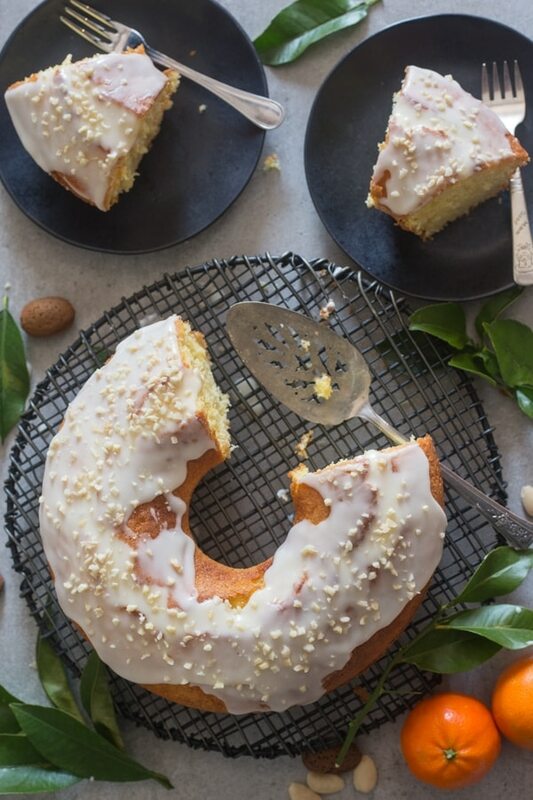 Fast and easy to make, this Italian Glazed Mandarin Orange Almond Cake is made with Greek Yogurt and Oil. 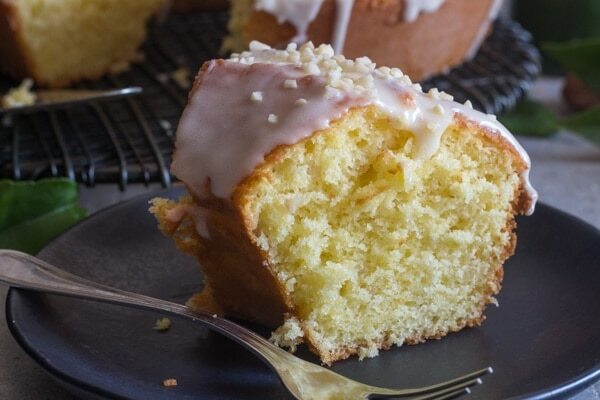 A couple of years ago I shared my Italian Fresh Cream Lemon Cake and this year we are going for another citrus cake. Enjoy! 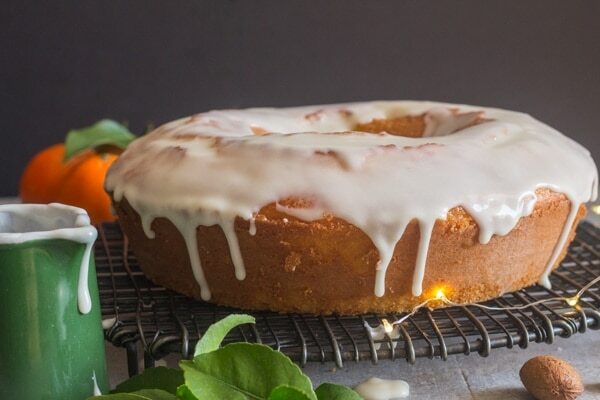 Italian Glazed Mandarin Orange Almond Cake, an easy Breakfast or Snack Cake, fresh Mandarins and a simple glaze is all you need. Delicious. Pre-heat oven to 340° F (170°C). 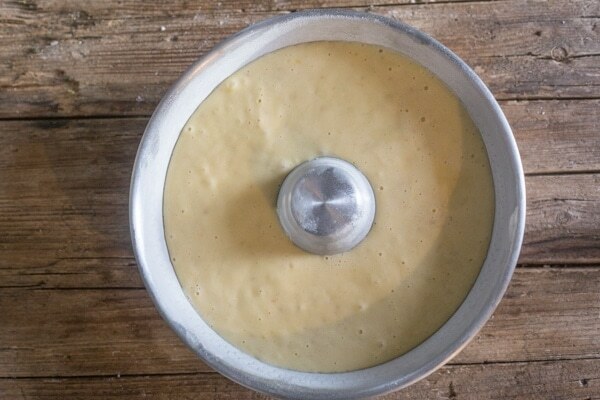 Grease and flour a 9 inch (22 centimeter) bundt pan. In a medium bowl beat until fluffy eggs and sugar, gently fold in yogurt, and fold in the flour mixture, then add the almonds, oil, juice and then zest. Pour into prepared cake pan and bake for approximately 25-30 minutes or until tooth pick comes out clean. Let cake sit approximately 15 minutes, then remove from pan. When cool drizzle with glaze or sprinkle with powdered sugar. In a small bowl add icing / powdered sugar, juice and 1 tablespoon cream or milk, stir together until smooth, if too thick then add a little more cream or milk, if too thin add more icing / powdered sugar. Reposted from December 19, 2016. I received fresh mandarins from California and needed to use them. I found your Italian Glazed Mandarin Orange Almond cake recipe. I made it for my husband’s birthday! It was a huge hit! Love the texture and the flavor was amazing! I made it again the next day for an event at my house and again it was a fovorite. Thank you! Hi Kaaren, thanks so much, so glad you enjoyed it. Have a great weekend. 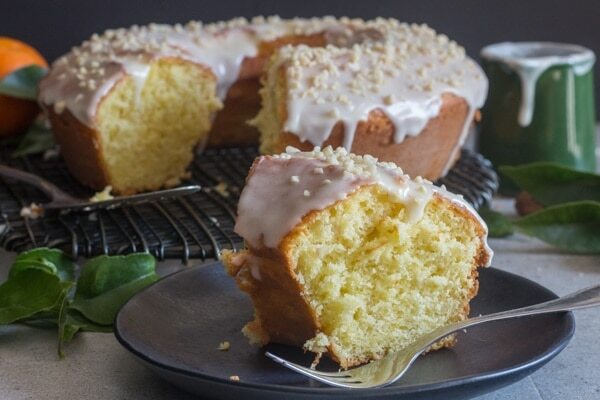 bundt cake. This cake looks delightful! My only worry is the almonds .Three if my four grandchildren are allergic to nuts. I’m wondering what I can substitute for the almonds. Hi Rita, thanks so much, how about dark chocolate mini chips (1/4 – 1/3 cup should do)? Toss the chips with a teaspoon of flour first so they don’t sink to the bottom. Let me know how it goes. Merry Christmas. This sounds like a winner to me! Wondering, could chopped walnuts replace the almonds? Do you think it would change the taste very much? Hi Bob, thanks, and good question, I think the combination of mandarin and walnut would work, although I have never tried it, almonds are just more popular in Italy. If you do try it let me know. What part of Italy 🇮🇹 are you living in. For two and we came back for 4 more years. Food and they use to bring food to my mom all the time.
. Sadly she passed away in 95 and I miss her dearly. Rather have the actual book..
Would it be possible to double this recipe and have it turn out the same? Hi L I have never doubled it so to tell the truth I can’t say how it would turn out. If you want to give it a try, let me know. Happy Easter. The instructions failed to mention adding the corn starch, baking powder, soda and salt even though they were on the ingredient list. Unfortunately cake was in the oven before I realized this! Hi Mary, so so sorry, thank you for letting me know, I have corrected recipe. Baked this yesterday and it was so good. Definitely adding this recipe to my collection. I had to make substitutions based on what I had available with great success. Instead of yogurt, I used full fat sour cream and I used almond meal instead of finely chopped almonds. The cake was super tender and delicate and isn’t overly sweet. I am drowning in mandarins right now, so I think I will be making a number of these as Christmas gifts for my co-workers so they can have a fresh baked treat at breakfast or tea time during the holiday madness. Thank you for the recipe! Hi Catherine, so glad you enjoyed it. And great gift idea. Have a wonderful Christmas. Can you use sour cream for the Greek yogurt? Also can you make this in mini bunt size pans I’m going to take to neighbors as gifts for Christmas. Will be using our fresh picked mandarins. Hi, Can I use the canned mandarins ? This sounds excellent. Hi Marikyn, to tell the truth I have never seen canned mandarins. Fresh really are better. But if you do use canned let me know how it is. Hope that helps. I will have to make this one. The mandarin oranges are so delicious here and we have lots. We will be away from family this year because we are living in Italy for 18 months but next year I will have my family around me. Hi Ellen I hope you like it and enjoy your stay in Italy. Have a wonderful Christmas. This is a gorgeous cake! I have made many of your recipes but I am not convinced that this is EASY. I will have to think this one over. My children cannot be home either & they are keeping my grandchildren as hostages. 🙂 So, I will wait until we are all together to try this cake. (My husband and I don’t need to eat the whole thing!) Enjoy the holidays.